Countless spreadsheets and a little bit of faith were the key components of Habitat for Humanity of Collier County’s volunteer management program. Habitat for Humanity of Collier County had many volunteer opportunities but they did not have an effective way of tracking who registered for each program,which was impacting volunteer relationships. In addition, there was no way to assure they had the correct contact information for their volunteers. They could not confirm that the data they had on file was accurate. This made it challenging to build and maintain volunteer relationships. “We had no clue who or how many people would come out and volunteer on any given day. 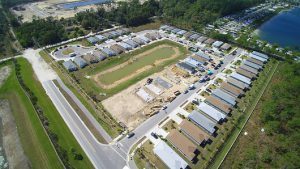 It was a challenge to make sure we had all the volunteers we needed for each opportunity,” said Derek Perry, Volunteer Services Director at Habitat for Humanity of Collier County. The majority of Habitat for Humanity of Collier County’s volunteer management efforts consisted of guesswork. They were managing anywhere between 3,000-5,000 volunteers at any given time. Since the majority of volunteers would just show up for events without proper volunteer registration, it was challenging to keep track of each volunteer’s commitment. “Our affiliate was disorganized and overwhelmed and often forced to improvise,” Perry said. During one of Habitat for Humanity of Collier County’s regular events, they had 100 volunteers show up unexpectedly. Their staff was unprepared and ill-equipped to handle the scenario. They were unable to communicate any changes to their volunteers. They knew they needed a solution to better organize their volunteer efforts, and improve volunteer relationships. VolunteerHub was the solution they had been looking for. VolunteerHub was able to help them organize registration and effectively communicate with their volunteers to positively impact volunteer relationships. In the construction industry, changes happen all the time. VolunteerHub gave them a way to efficiently handle those changes and provide clarity, where in the past there had only been confusion. They were able to instantly text and email all registered volunteers with changes. “We have countless examples of deliveries being missed or staff members being sick. Being able to migrate our volunteers to a site instantly has saved the day on more than one occasion,” Perry said. This transition also allowed them to balance leadership with the variety of skill sets in their nonprofit. They created crew captains who they gave administrative access to the new software. This developed a structure for all volunteer opportunities and events. They could now direct people on a larger scale. VolunteerHub’s Kiosk feature made volunteer check-in seamless. Volunteers could now check in with one click of a button. The Kiosk capabilities also inspired Habitat for Humanity of Collier County to be more resourceful. One of their carpenters was able to build a solar panel to power a broken iPad for volunteers to use during check-in. “Now with VolunteerHub, our check-in process has empowered volunteers to monitor their own hours. VolunteerHub has also helped our affiliate better organize hours allocated to volunteers at job sites,” Perry said. Transitioning to VolunteerHub also allowed Habitat for Humanity of Collier County to track and monitor their volunteers’ commitment and hours. Not only could they track volunteer hours but they could contact their super supporters. When a volunteer’s dedication stood out, they could contact that individual and build a stronger connection with them. “We have improved productivity and volunteer experiences. We have a greater utilization of allocated volunteer hours and volunteer participation,” Perry said. 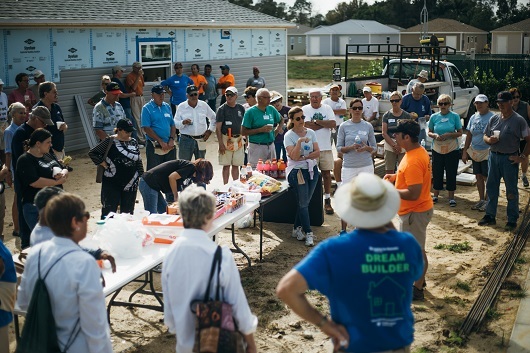 After Habitat for Humanity of Collier County’s conversion to VolunteerHub, they have exponentially grown the effectiveness of their volunteer management efforts. They can efficiently communicate with their volunteers while keeping a personal touch to improve volunteer relationships. Most importantly, now they can help even more homeowners achieve the strength, stability, and independence they need in order to build a better life for their families.